There are many peripheral devices that help us to make the most of our home computers, but traditionally, every time you connect a peripheral device, you have to add another cable (or two). All those messy cables get annoying over time, no matter how hard we try to tidy them up. Getting rid of the wires by using wireless networked devices is a popular idea as it eliminates lots of clutter. Although unless you are using a laptop, you’re going to have to some cables or wires, a mains cable at the very least for both computer and monitor. So totally wireless is not really feasible, but you can certainly remove much of the cable and wiring clutter by going wireless! If you are thinking about replacing your PC, then another option to reduce cables is to buy an all in one type PC, where the computer and monitor and joined so only one mains cable is required and no cable from computer to monitor screen – but this does not make financial sense unless you are replacing your computer in any case, plus their are some downfalls to all in one computer systems, not least of which is the difficulty of future upgrades. To reduce cables with your existing PC set up, wireless is the only sensible option. Many home computers on sale today come with built-in wireless networking and Bluetooth, so can be supplied with a wireless keyboard and wi-fi mouse as a package. Even laptops come with built-in wireless capabilities and a Bluetooth keyboard when used with a laptop can really increase productivity thanks to faster typing on a full size keyboard. Wireless or Bluetooth keyboards are also handy for Smart TV’s, trying to surf the web using the TV remote is an excruciating experience! 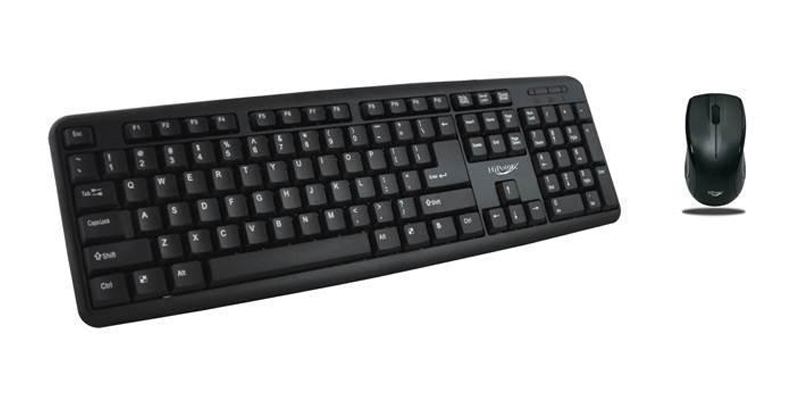 Plus wireless keyboards can also be used with gaming consoles such as the xBox and Sony Playstation 4. Wherever possible, it makes sense to go for a wireless keyboard and mouse combo, as this will use less wireless receivers (and therefore USB ports) on your computer. To make use of wi-fi networking and remove the need for a network cable, you will need to have a wireless router. This router will also allow you to connect your printer over Wi-Fi which will further reduce the number of cables. A wireless set-up will considerable reduce the cable clutter and make your home office or entertainment area look much neater. In addition it is much easier to reposition your workspace and the peripherals should you ever need or want to in the future. Pretty much every peripheral computing device can be connected wirelessly using a wi-fi network or paired via Bluetooth – keyboards, mouse, printer, scanners, even external hard drives! The only real downsides to going wireless are the increased complexity, so more chance of something to go wrong, plus the fact that all devices will need batteries which will need replacing/recharging at regular intervals. There is also the remote possibility of your network being susceptible to interference from other wireless equipment.